Inseparable from the smile, the dental facets were created to restore or optimize this facial expression whose social role is no longer to prove. Since it is well known that the beauty of a smile is based on its harmony and balance, more and more people are using artifices to erase its flaws: shape, size, surface condition, color … The facets precisely among these artifices. The earliest dental facets date back to 1886, a relatively recent date compared to the remains of dentures in the sixth century BC. At the time, they consist of sticking on the teeth ceramic jackets. Presenting a very small bonding force, they are only posed during filming. Thereafter, and over the years, adhesion to dentin is improved and facets less and less invasive. What is a dental facet? A dental facet is a device in the form of a prosthesis, generally composed of a thin ceramic film, and which allows to modify the structure, the position, the shape and especially the color of a tooth. The key point of the success of this device lies in the collage: the facet is indeed glued to the email. Thin, they are a less invasive alternative to sealed prostheses. In which cases, should we think about it? Staining due to tetracyclines . These antibiotics, prescribed mainly to treat respiratory infections and acne, cause color abnormalities due to a phenomenon of chelation with calcium ions 6 . An excess of fluorine . In high doses, fluoride causes the appearance of dyschromias and dental porosities. Some acute traumas . Slight haemorrhages can lead to inflammatory reactions, which in turn induce the creation of a substance that will close the endodont: dentin. The tooth will therefore have a more opaque color, which will tend towards either orange or greyish. Some teeth, mainly the lateral incisors and the premolars, may be conoidal: they are called rice-like teeth. On the other hand, some people suffer from inter-dental black “triangles”, in other words “holes”, formed after bone loss, trauma or periodontal disease. These two problems of form can be masked by the dental facets. As a result of some trauma, there is a loss of tissue. When this is low, people are advised to use the composite lamination technique. When this is important, rehabilitation by the dental facet can be considered. In which cases should it be renounced? There are several parameters to evaluate before considering the installation of dental facets. Bruxism . Bruxism refers to the creaking or clenching of teeth outside the periods of chewing or swallowing. Such a condition affects both children and adults at night and day. But it is the night that causes the most problems, because the absence of any control increases the risk of violent shocks and significant dental friction. For this reason, it constitutes a formal contraindication to facet aesthetic rehabilitation. The failure rate would be 7 times higher than that in a person who does not suffer. Colorimetric anomaly . If the color defect is too great, the facet treatment becomes very complicated. 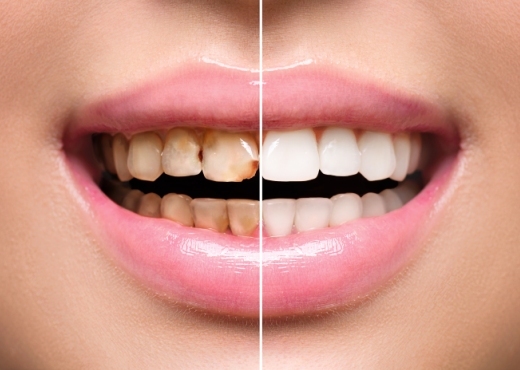 The more the tooth is discolored, the more the facet must be thick to hide the unsightly color. Periodontal disease . Periodontal diseases undermine bonding due to multiple micro-infiltrations. They are a contraindication to dental facets. Tobacco and lack of hygiene . The dental facet may stain faster than the rest of the teeth, in case of smoking. Moreover, in case of lack of oral hygiene and excess of tobacco, the risk of caries under the prosthesis is greatly increased. Dental facets are to be considered when less invasive treatments have failed. They can only be offered when the contraindications have been ruled out. If so, the success rate, twelve years later, is close to 95%. Before the validation of the therapeutic project, the practitioner imposes a preview called mock-up. It allows the person to realize the final aesthetic result, which can sometimes be abrupt: the teeth can be perceived as overly bulky and some speech problems can occur due to new pressures on the lips. – The ceramic facets . The most used ceramics for dental veneers are feldspar ceramics, leucite-reinforced feldspar ceramics and infiltrated aluminous ceramics. The preparation required for the placement of these facets is a difficult exercise for practitioners with great clinical experience and dexterity. They also imply a substantial investment. – Composite resin facets . These facets are less expensive but their biomimicry is not always as convincing as the ceramic facets. The improvement of their range of opacities is interesting but the mechanical properties of the composites will have to follow the same way to increase the number of indications.